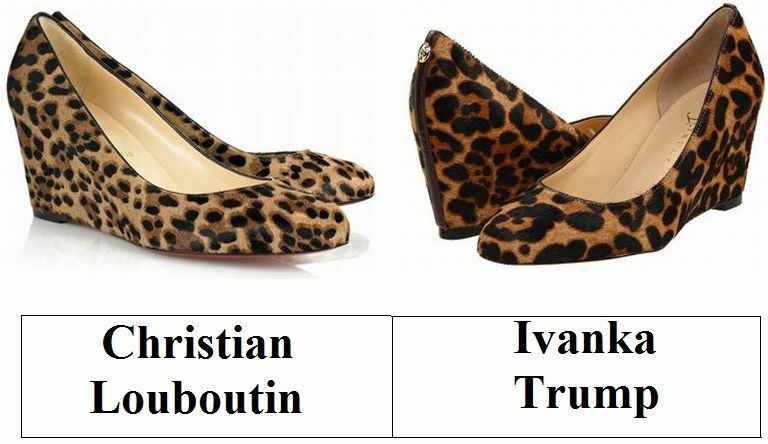 Lovers, to your left take a peek at Christian Louboutin’s pretty Peanut 70 Leopard Print Wedges; to the right cast your gaze upon Ivanka Trump’s luscious Linear3. While Trump’s tempting Linear3 is ever so slightly darker in shade than its couture cousin; for just $150.00, in comparison to the whopping $845.00 required to spice up your life with Louboutin, they are the quintessential way for one to take a walk on the wild side – without breaking the bank! I don't know if I would get either of them unless there were different styles and such, because I am not a fan of the animal prints. I didn't know Ivanka was making shoes! hm, i think i'd actually pass on these... the wedges are too low i think.. I had no idea about Ivanka Trump in the shoe biz. Very cool shoes. Oh, go Ivanka! I like these. Awesome price Ivanka Trump has going for these. I also didn't know Ivanka was making shoes! I like just a splash of print like this. I'd go with the Trump. I prefer the print on the Linear3 and I do love a wedge. love them! love leopard print on shoes. Lovely shoes! The Ivanka Trump pair is just as nice. I need a pair of Louboutins in my life!! Their both pretty cute but Ivankas are the ultimate deal!!! Cheap but uber chic is my game! Not a fan of wedges, so I'm leaving this one alone. But I do tend to love Ivanka Trump's style! Those are cute! Very wearable! No one could replace Christian Louboutin in my heart! I want these! One of my favorite prints and in a wedge?? They're both too cute! Meow! So cool! Glad you found a cheaper version too. I actually love the Ivanka's more! Very nice animl print shoes! In this case, I choose Loboutin!!!! Am not into animal prints, but I prefer the Louboutins this time. They definitely have a better finish and color. Love them both. I love cheetah prints so much! hmmm either shoes i would love to have! Oh I LOVE Ivanka and those shoes are beautiful! I love animal prints, especially fiesty kitty kats! I probably wouldn't get either pair though, to be honest.